We always made chapati, or ghadichi poli (folded roti) at my mother's home. The girls who could roll out chapatis were usually classified for their proficiency. 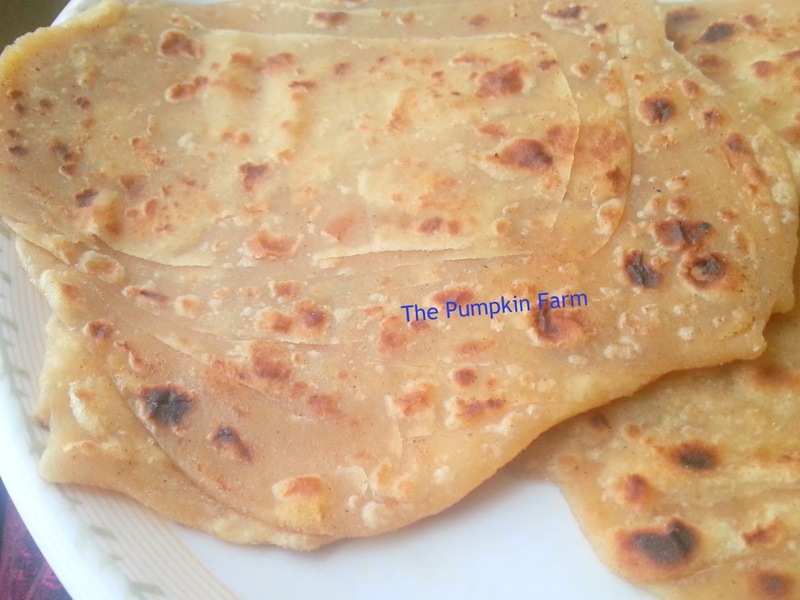 The one who could manage most layered chapati was the best..."padar sutle ka? " , "padar" or literally translated in hindi as pallu (as in saree pallu or plait), was the standard question asked after we were done with the roasting. I am still not very good at it but I understand the obsession. You will too..if you try making this similar version of layered parathas laccha paratha or satpura phulkas as they are popular in other regions. The one we make is pretty basic but this one almost always yields the results effortlessly. 2)Make small balls of the dough and roll them out flat. 3)Brush the top with some ghee, dust some flour. Flaky and prefectly rolled lachcha paratha, love them simply with some paneer butter masala. wow prefect lacha's on parathas dear :) looks so yumm love to have them with a spicy gravy !! Add some red chilli powder, salt, chaat masala after the first roll and make these to eat with just ghee or butter. Simple superb. These are one of my fav ones...love the layers and then drizzle them with some ghee or butter. The layers are showing out so well Pradnya!Good one yaar.. I love these parathas..though never tried adding the spices in them..will try it next time.. This is my daughter's fav paratha. It has turned out perfect..
Lovely paratha with layers.. Looks perfect. The ones I have had is the multi-fold the rolled out dough and make a round and then roll out again kind. Like the parottas. Never tried the stripe, layer and roll method..
Love lacccha paratha specially with paneer curry. Nice layered parathas! It is a bit of a job, but worth the effort...looks lovely! Pradnya my poli what padar I just wish it leaves the polpat:) So teching my daughters making chapati will be their MIL's job :D. As for these paratha you make I will eat. For I get ribbed enough for my chapats .